Fridge Magnets - 4" x 7"
•Provice your customers with something special, while keeping your business in teh forefront of thier minds. 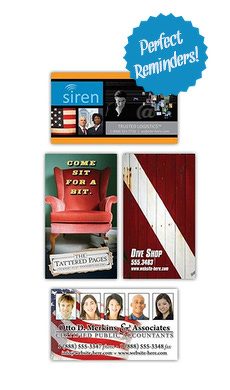 • The 4x7 fridge magnet is perfect for marketing or announcements. It is also a great size for calendars and schedules. The large area provides more space for your artwork, logos, and contact information making it easier for clients or prospects to contact you. • These magnets are printed using a four color printing process, allowing for an infinite number of color possibilites. The fridge magnet is made from an extremely durable 0.25mil thick material. This is the third year we have worked with this company and couldn't be happier. FourColormagenets.com provides personal service and a quality product. We will be back. This is the second time we have ordered this product. Not only is the price much less than the other options we found, but the production time was extremely quick, the service was great, and everyone really likes the finished product. The magnets arrived one day late, but the final product was great! We plan to order them again. This was the best idea I have come up with to promote my small ebay store. Troy contacted me the very first day and worked very hard to make sure my vision was realized. The magnets are perfect and most professional - ordering over the internet, sight unseen is somewhat of a challenge, especially with a company you have never dealt with previously. The whole experience could not have been more pleasurable. Not to mention their patience - they worked with me until the language and logo placement were perfect. The made me feel that my small order was their number one priority. Since ordering the magnets I have purchased business cards and have a number of other ideas in which I will utilize their services.